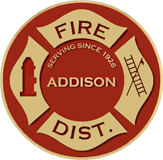 The Addison Fire Protection District is committed to providing access to and copying of public records in accordance with the Illinois Freedom of Information Act. Please review this page for further information about request procedures, materials available, public access to records and a printable copy of our Freedom of Information Act Written Request for Records form. For any additional information, the administrative office located at headquarters station (10 South Addison Road) is open weekdays from 8:00am to 4:30 pm or you may call these offices at (630) 628-3100. Please note – the information contained on this website concerning the Illinois Freedom of Information Act has been placed here in order to provide easy access to information about this Act on our website and by no means should it be considered the entire Act. Information about the Illinois Freedom of Information Act can be found by clicking here. All public requests for information and/or records will be processed through the administrative offices of the District, located at 10 South Addison Road, Addison, Illinois. The Deputy Fire Chief serves as the Freedom of Information Officer for the District. Requests shall be directed to the Deputy Fire Chief of the District pursuant to the District’s administrative regulations at our headquarters fire station located at 10 South Addison Road, Addison, IL, 60101. The first 50 black and white copies are free. Thereafter, each page will be charged $ .15 per page. Electronic, color or oversized copies will be charged at the maximum statutorily amounts allowed. Fees not otherwise fixed by statute will be reasonably calculated and charged to reimburse the actual cost for reproducing and certifying public records. The District shall make available its public records to any person requesting access pursuant to the provisions of the Illinois Freedom of Information Act (5 ILCS 140/1 et seq.) (the “Act”), as well as other applicable law. The District shall not provide access to public records or portions thereof that are exempt from disclosure under the Act or as provided by other applicable law. Denials of requests for records will contain a detailed factual basis for the denial. The District shall delete any information which is exempt from disclosure under Section 7 of the Act (5 ILCS 140/7) from a public document which contains nonexempt material, and make the remaining information available for inspection and copying. Any person wishing to inspect or copy a District’s public record shall submit a written request to the Deputy Fire Chief. While the use of a specific form is not required, our FOIA form is available on our website or the District will provide a form upon request. Requests are accepted via personal delivery, mail, facsimile or email if directed to ADMIN@ADDISONFIRE.ORG. Requests must specify District records with reasonable particularity to avoid inefficient use of staff time in retrieving and preparing records for inspection. Upon receipt, the Deputy Fire Chief or designee shall mark the date received upon the request, along with the date a response is due. The District shall either comply with or deny the written request for public records within five (5) working days after its receipt. Denial shall be by letter as provided below and contain a detailed factual basis for the denial. Failure to respond to a written request within five (5) working days after its receipt shall be considered a denial of the request. The request is couched in categorical terms and requires an extensive search for the records responsive to it. There is a need for consultation, which shall be conducted with all practicable speed, with another public body or among two or more components of the District having a substantial interest in the determination or in the subject matter of the request. When additional time is required for any of the reasons listed, the District shall notify by letter the person making the written request within five (5) working days of receipt of request. The response times contained in this Section may be extended with the written agreement of the requestor; and the Deputy Fire Chief or his designee shall maintain a copy of each request, response and written communications with the requestor and all documents submitted. Inspection of District public records not excluded from inspection under the Act shall be permitted between the hours of 8:00 a.m. and 4:30 p.m., Monday through Friday, on days the District office (10 S. Addison Road) is open for business. Inspection must be made at the District office, and records are not to be removed from the District office. The Fire Chief or his designee shall be present during inspection of District records. Inspection will not be allowed when records are in immediate use by persons exercising official duties which require use of the records. Copies of requested records will be provided by District employees within the limitations of District copying equipment. Letter-sized, black and white copies are charged at $ .15 per page after the first 50 copies. Persons requesting electronic, color or oversized copies of District public records shall reimburse the District for its actual cost for reproducing public records, as determined by the Fire Chief or his designee. Each record certified shall cost $1.00. Documents shall be furnished without charge or at a reduced charge, as determined by the Board of Trustees, if the person requesting the documents states the specific purpose for the request and indicates that a “waiver or reduction of the fee is in the public interest” pursuant to Section 6(b) of the Act (5 ILCS 140/6(b)). In setting the amount of the waiver or reduction, the District shall take into consideration the amount of materials requested and the cost of copying them. Records may be produced electronically, if requested. The District will email records where practicable. When requests are unable to be sent via email or the requestor does not desire emailed copies, the District shall purchase appropriate electronic media and copy the documents to the electronic media. The requestor will pay the actual cost of the media. In no event may the District accept electronic media from a requestor. Requests calling for all records falling within a category shall be complied with unless compliance with the request would be unduly burdensome for the District and there is no way to narrow the request, and the burden on the District outweighs the public interest in the information. Before invoking this exemption, the District shall extend to the person making the request an opportunity to confer with it in an attempt to reduce the request to manageable proportions. The District shall invoke this exemption in writing to the person making the request specifying the reasons why it would unduly burden the District and the extent to which compliance would so burden the operations of the District. Repeated requests for the same public records by the same person shall be deemed unduly burdensome under this provision. The Fire Chief or his designee shall be present during inspection of District records. Inspection will not be allowed when records are in immediate use by persons exercising official duties which require use of the records. Copies of requested records will be provided by District employees within the limitations of District copying equipment. When a requested document contains information of a highly personal nature or whose release would be objectionable to a reasonable person, the Deputy Fire Chief must determine if the subject’s right to privacy outweighs and legitimate public interest. If the Deputy Fire Chief determines the legitimate public interests outweigh privacy interests, the Deputy Fire Chief shall release the documents. If the Deputy Fire Chief determines the right to privacy outweighs any legitimate public interest, the Deputy Fire Chief shall seek an advisory opinion from the Public Access Counselor pursuant to the procedures adopted by that body. If the Deputy Fire Chief believes the advisory opinion is in error, with the consent of the Board of Trustees, the Deputy Fire Chief may seek judicial review of the decision. When the Deputy Fire Chief (or designee) determines that a requested document is exempt under Section 7(1)(f) as a preliminary draft or other document exempted under this section, he shall initiate the advisory opinion procedures of the Public Access Counselor. If the Deputy Fire Chief believes the advisory opinion is in error, the consent of the Board of Trustees, the Deputy Fire Chief may seek judicial review of the decision. Prior to responding to a request for records, the Deputy Fire Chief shall determine whether the requested records will be used in any sale, resale, solicitation or advertisements for sales or services. If the Deputy Fire Chief determines that the request is for one of these purposes, it shall be deemed a commercial request and response shall be governed by this section. Requests received from news media, non-profit, scientific or academic organizations shall not be considered commercial requests. When a request is for a commercial purpose, the Deputy Fire Chief shall respond to the requestor within five (5) business days, informing the requestor that the request is considered commercial. Within twenty-one (21) business days after the receipt of the commercial purpose request, the Deputy Fire Chief shall respond to the requestor. Such response shall either: 1) provide an estimate of the time required to provide the records, including a requirement that the requestor pay for the copies; 2) deny the request pursuant to one or more exemptions found in the Freedom of Information Act; 3) notify the requestor that the request is unduly burdensome and extend an opportunity to the requestor to reduce the request to manageable proportions, or 4) provide the requested records. When estimating the time required for responding to a commercial records request, the Deputy Fire Chief should consider the size and complexity of the request. Priority shall be given to non-commercial requests. Records regarding performance of emergency medical services are not subject to disclosure under the Freedom of Information Act. Disclosure of such records is governed by the disclosure procedures found in 735 ILCS 5/8-802. Addison Fire Protection District, DuPage County, Illinois, is a fire protection district organized pursuant to the Illinois Fire Protection District Act (70 ILCS 705/1 et seq.) to provide fire protection and other emergency services to the residents of the District. The District’s operating budget is comprised of tax collections for both fire and ambulance services along with grants, donations, and other misc. forms of revenue. The District’s headquarters fire station is located at 10 S. Addison Rd, Addison IL. 60101. The District employs approximately sixty (60) full-time employees.